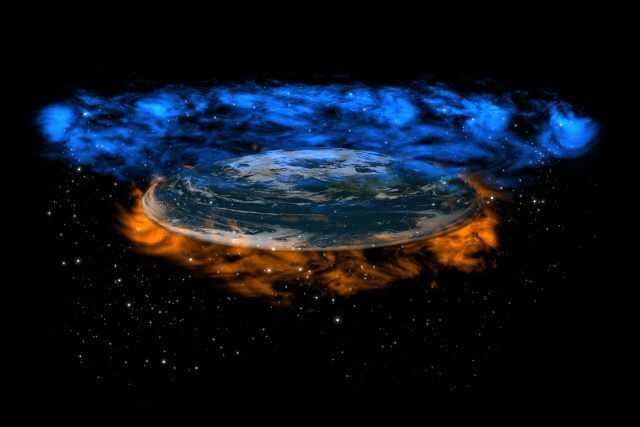 Most believers in a flat Earth think the planet is a flat disk surrounded by an ice wall. More than 200 flat-Earth enthusiasts descended on West Midlands, England, this past weekend to "engage freely in deep and meaningful discussions," according to the Flat Earth Convention UK. The Earth's glorious globular-ness was proved more than 2,000 years ago by the ancient Greeks, but there's a small subset of people who think the planet is a disk despite enjoying the downward pull of gravity that could only result from living on a sphere. Among the nine speakers were Nesbit, a musician who became interested in flat-Earth beliefs in 2014; Dave Marsh, a manager with England's National Health Service; and Gary John, an independent flat-Earther who put on the convention. Marsh was one of four speakers who are associated with the flat-Earth research group called FEcore. His research focuses on the moon, "as he believes it is the key to unlocking the globe earth deception," according to the convention website. He studies the speed of the moon across the night sky. (Flat-Earthers believe the moon and sun orbit around Earth's North Pole.) "My research destroys big bang cosmology," he said, according to Physics-Astronomy.org. "It supports the idea that gravity doesn't exist and the only true force in nature is electromagnetism." Another speaker, Martin Kenny, purports to have broader views of a flat Earth than other believers. "It is my innerstanding that there are other lands, dimensions and civilizations yet to be discovered across and within the plane of our Earth. The whole earth consists of 4 concentric rings of land, each ring having its own sun and moon, which would be our wandering stars," he says on the convention website. As for how many people buy into this clearly mistaken belief, that is unknown. However, the oldest flat-Earth organization, the Flat Earth Society, claims to have 555 registered members as of August 2016. According to the society's website, the group was founded by an English inventor named Samuel Birley Rowbotham in the 1800s. In addition to the Q&A's with the nine speakers at the three-day convention, there was apparently a talk entitled "Heliocentric v Geocentric experts Debate." The convention's site doesn't indicate who was debating these two views, one proved ages ago, and the other suggesting Earth is fixed in space with the universe revolving around it. This isn't the first flat-Earth convening. In November 2017, the Flat Earth International Conference was held in Raleigh, North Carolina. That convention hosted some big-name (in flat-Earth circles, at least) speakers, such as founder of the Flat Earth Clues series on YouTube, Mark Sargent, who thinks we are all locked inside a "Truman Show"-like dome structure. The next FEIC is scheduled for Nov. 15 -16 in Denver. We hope you don't fall off the planet before then. The earth is flat because of pac man? Who are these nuts? You know the world is upside down when the news that a politician is stepping down because of offensive cultural remarks is pushed out of the headlines by the news that the same politician believes the Earth is flat. Forget science tests … is it time to consider entrance exams for running for office? There you go again, Nathalie Lemieux. Now you’ve offended people who believe the Flat Earth theory could have been developed by a woman. Ms. Lemieux is, or was, the deputy mayor of Gatineau, the fourth-largest city in Quebec. She was stripped of that office for making a comment (not the one quoted above – I’ll get around (aflat?) to it next) to the CBC that she didn’t believe Islamophobia exists and didn’t recognize the word. While she later apologized for this offensive comment, that was enough for Gatineau Mayor Maxime Pedneaud-Jobin to fire her as deputy mayor but let her keep her job as councillor — because apparently that’s how they roll in Canada. I’m changing my name to Generic Goose. What’s worse than losing your job? These days, it’s putting yourself in the sights of trolls who dig deep into your social media past and find other things (or photos – enough said) that will bring further embarrassment and/or notoriety. In Lemieux’s case, that led to an online comment she made two weeks ago implying that she believes the Earth is flat and that information is being covered up by a conspiracy of Round-Earthers. As expected, this became the really big news. First off, don’t go dragging NASA into it when you’ve got your own Canadian Space Agency (CSA) with astronauts who have been to the International Space Station and stared down at the surface of the Earth which doesn’t get its curves from exercise or a lens distortion. If you’re not going to believe the news (should we believe your press release? ), then science seems like a good alternative for the “research” you claim to “always” do. Ever heard of Pythagoras? Or do you eschew the Greek philosophers and mathematicians in favor of the modern Celtics like Kyrie Irving? Perhaps she can use some of her newly-acquired free time to book a berth on the upcoming Flat Earth cruise to the edge of the world. It’s possible that Lemieux brought up her Flat Earth views as a way to show that it’s OK to be skeptical about things. And it is … as long as those things aren’t scientific facts or well-documented research (which she supports) on the destructive effects of cultural and racial hatred and discrimination. Lemieux deserved to be reprimanded for her comment on Islamophobia. It’s too bad the comments on a Flat Earth didn’t come out first. Many of the problems the world is facing come from leaders ignoring science (even in Canada!) to the detriment of the health and well-being of their citizens, who are forced to leave for countries where science is hopefully a tool for the betterment of all (a group that keeps getting smaller). If leaders like Lemieux are skeptical about the Earth being round, what other facts do they question? Maybe it IS time for a political entrance exam. Well, the “tough” Flat Earthers are getting going and they’re going to … Antarctica! For those not familiar with the theory, the continent at the bottom of the planet that’s round to the rest of us is different if a globe were flattened with the North Pole in the center. Then, the outer rim would be a thin band we’d all call Antarctica. For those who know their math, that’s also called a circumference. The circumference of the round Earth is about 24,900 miles (40,000 km) but that’s around the equator and there’s still the southern hemisphere to flatten out and add to the flat map. In an interview with Forbes, flat-earther Jay Decasby, who is developing a flat earth reality series, puts the white ring of Antarctica circling such a round map at over 60,000 miles. “But, but, but!” you say … didn’t Colin O’Brady just complete the first-ever solo crossing of Antarctica on a trip that took 54 days and measured 932 miles from the Atlantic Ocean to the Pacific Ocean via the South Pole? Decasby scoffs at your question. That’s right. He claims the best way to prove the Earth is flat is to sail a ship around the circumference of Antarctica which should be 60,000 miles. Such a trip would also prove that the edge of the Earth is circled by a wall of ice 150 feet high. Captain James Cook did this first, although that claim is obviously disputed by flat earthers like Decasby who says there’s no way Cook sailed 60,000 miles (did you catch the flaw in this logic? ), but still quotes Cook’s description of a high wall of ice in which the captain was never able to find an inlet that penetrated it. Never mind that Antarctica has since been circled many times and many inlets have been found. Jules Verne’s Phileas Fogg strove to go around the world in 80 days. Viking Ocean Cruises is offering an Ultimate World Cruise that will circumnavigate the Earth and visit 59 countries in 245 days (for the low, low price of $93,000). Why not, in the name of science or the debunking of science, let these flat earth believers finance and sail a ship around Antarctica and prove their theory to the “the sun-worshipping cult of heliocentrism” or forever hold their peace? Entertainment could be provided by bands singing flat versions of “I Get Around,” “Roundabout” and “Fat-Bottomed Girls (You Make the Rockin’ World Go Round).” The challenge will be to find a cruse ship with a big enough galley to stock a buffet for 60,000 miles. What would Bluto say?